Don’t bother reading the news this morning, it’s just full of pranks and awful jokes. 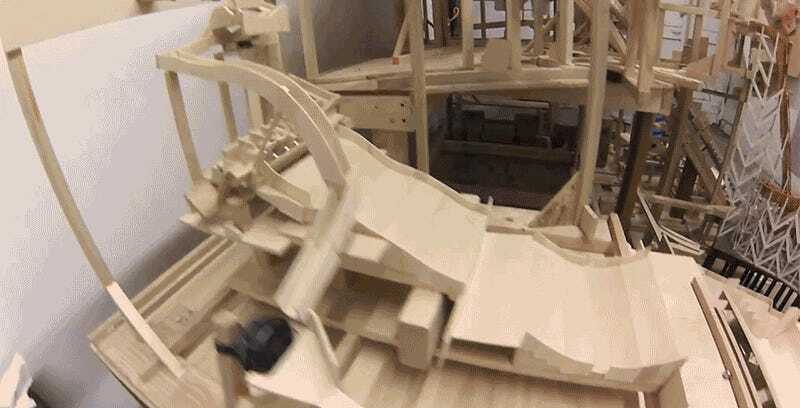 A much better use of your time would be spending seven minutes watching Ben Tardif’s eight-foot tall marble maze mountain that features 25 different themed sections that connect to create one massive kinetic sculpture. Look closely and you’ll spot a miniature roller coaster, sections of the Great Wall of China, San Francisco’s famously twisted Lombard Street, Times Square, and even a skatepark hidden on the mountain. It took Tardif three years to build, and if we had a front-row seat it would probably hold our attention for a lot longer than that.